Although he was a footballer of undoubted ability, Bill Redmond was also a victim of circumstance in that he wasn't able to fulfil his potential at VFL level. In his first two seasons at Princes Park, he rose from Best and Fairest with the Blues’ Under-19 squad, to being named as an emergency in Carlton’s 1947 Premiership team. But in 1948 a wrangle over his recruitment saw him leave the Navy Blues, and head off to a long and successful career in country football. Born William George Arthur Redmond at North Melbourne in 1927, Bill grew up in inner-suburban Brunswick during the grim years of World War II. Football, cricket and his apprenticeship as an engineering pattern-maker occupied his teenage years, and he was outstanding at all three. By 1946 he had already played in the First XI at Brunswick Cricket Club before Carlton invited him to join their Under-19 team preparing for the inaugural season of the VFL Thirds competition. Under their coach Jim Francis, the Blues youngsters made an impressive debut and qualified to play North Melbourne in the first-ever Under-19 Grand Final. Carlton was comfortably beaten, but at centre half-back, Redmond won the Ken Luke Cup as Carlton’s best player. 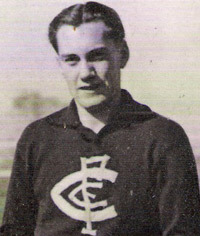 A few days later, Bill and his team-mate Ron Dunn were voted joint Best and Fairest, and the following year Redmond was promoted to Carlton’s Reserves list and given the honour of wearing the Blues’ number 2 guernsey. Carlton’s senior team finished on top of the ladder in 1947 and went on to beat Essendon by one precious point in a thrilling Grand Final. Earlier in the season, Redmond had come under notice for his poise in defence for the seconds, leading to his inclusion in the seniors for the first time in round 13, when Carlton hosted South Melbourne at Princes Park and won by 4 points. Bill was 19th man that afternoon, as he was a month later in his second match, when the Blues demolished St Kilda. He finished off a notable first year as a senior player by being nominated as an emergency for Carlton’s Grand Final team, but wasn’t required. In 1948, Redmond established himself as a regular member of Carlton’s senior side from round one, when he lined up in a back pocket alongside champion full-back Ollie Grieve and went on to play the five games in succession. Then in mid-May, North Melbourne caused a stir by protesting to the VFL that Carlton had signed Redmond in contravention of the League’s zoning rules. Bill lived on a street in West Brunswick that was a boundary between the zones. “If you lived on one side of the road, you played for Carlton - and if you lived on the other side of the road, you were North Melbourne,” he explained many years later. Regardless, the VFL sided with the Shinboners, and revoked Redmond’s playing permit. North Melbourne were intent on getting Redmond to Arden Street, and flatly refused to clear him to Carlton. In turn, the Blues dug their heels in, and the dispute dragged on until VFA club Williamstown stepped in, and trumped both clubs by offering to almost double his match payments. “We got three pounds a game back in those days, and Williamstown offered me five, so I went with them,” he said. At Williamstown, Redmond played at full-forward in the Seagull’s 1948 Grand Final team that lost to Brighton. In 1950 he transferred to the Bendigo Football League club Eaglehawk, before joining North Bendigo in the Heathcote District Football League as captain-coach two years later. He was voted Best and Fairest in the HDFL in 1954, then switched to South Bendigo to star in their 1956 Premiership team. On the move again, Bill was appointed captain-coach of Inglewood before the Blues won the 1958 Loddon Valley Football League Premiership. He then returned to South Bendigo as captain-coach of their seconds, and collected consecutive flags in 1959 and 1960. By 1963 he was at Bridgewater in the LDFL, where he won yet another Premiership – as well as finishing as the competition’s leading goal-kicker with 51 majors. Eventually, after a varied and quite notable career, Bill retired at last in 1964, aged 37. While Redmond was at full-forward for Williamstown in the 1948 VFA Grand Final, future Carlton star Keith Warburton was playing in the centre for Brighton. During his time in Bendigo, Redman also played A Grade cricket for Golden Square and Sandhurst. Contributors to this page: Bombasheldon , molsey , PatsFitztrick , tmd1 , true_blue24 , Jarusa , WillowBlue and admin . Page last modified on Wednesday 23 of January, 2019 20:48:18 AEDT by Bombasheldon. 1973 - Ex Blue "Frosty" Miller keeps on. 1999 GF Parade - Kouta & Ang.